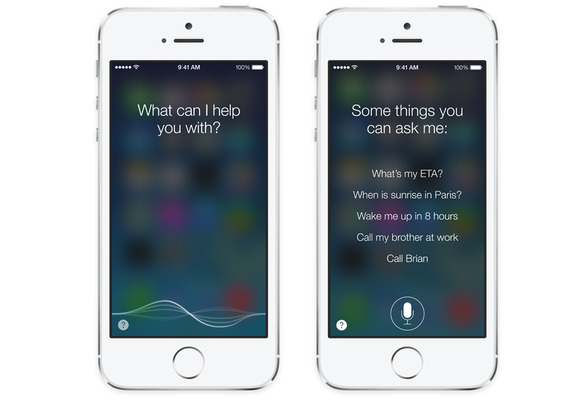 Siri lovers and skeptics alike have a lot to look forward to in iOS 7: Apple’s virtual assistant has become smarter and better spoken, and offers more-diverse searches. You still open Siri by pressing and holding on the Home button, but the look and feel has drastically changed from iOS 6. Apple’s virtual voice-activated assistant has a new look, new features, and a new voice. Instead of appearing on a linen backdrop, Siri fades in, blurring the background of whatever app or screen you happen to be in at the time. Tap the microphone button, and vocal waves appear, modulating as you speak your request; when you finish, the waves form into a spinning circle as your device communicates with remote servers to answer your query. The iPhone has always had Siri overlaid atop the entire screen, but in iOS 7, full overlay comes to the iPad as well. The assistant’s user interface does look a little more vacant on the iPad’s and iPad mini’s larger screen than on one of Apple’s smaller devices, but not by much. Text is larger on the iPad, Siri’s Multi-Touch buttons are bigger, and pictures are more vibrant. Perhaps Siri’s biggest improvement is in its voice: Gone is the somewhat mechanical-sounding assistant of the iPhone 4S; in its place are two new voices—one male, one female—to help you organize your day. They have much more musical responses than the previous voice, and sentences sound clearer and more human, thanks to a new processing algorithm happening behind the scenes. Sadly, for those of us who take pleasure in having our devices talk in odd voices, there’s still no option for famous computer voices (like HAL) or celebrities. Siri also has a slightly more-spirited double chime for when you’re both starting to speak and finishing. Control Center is a welcome addition, but it offers only a fraction of the settings you’ll find in the Settings app. Lucky for us, iOS 7 also makes it easier to find settings without digging through the app, thanks to one of iOS 6’s flagship features: Siri. In iOS 7, Siri has seen a number of big upgrades. One of our favorites is that Siri can now open some (but, alas, not all) Settings screens, and can change settings for you on the fly. Need to turn off certain preferences in a jiffy? Just ask Siri. For example, tell Siri “Turn off Bluetooth,” and it does so, confirming the change by saying “OK, I turned off Bluetooth.” Tell Siri “Open Notification Center settings” and voilà—iOS 7 opens the Settings app to the Notification Center screen. Say “Open accessibility,” and iOS 7 takes you to the Settings app and switches to the General > Accessibility screen. It’s a great feature that also serves as a makeshift settings search: If you don’t know where the systemwide text-size setting is, for example, just say “Change text size,” and Siri whisks you away to Settings > General > Text Size. Unfortunately, Siri can’t control all preferences just yet. Unfortunately, this new feature is limited to top-level and a limited number of second-level Settings screens. If you ask “Show me my usage,” Siri explains that such a task is beyond its abilities at the moment. And Siri refuses to open some settings screens at all, especially those related to security: Ask Siri to open the Restrictions settings, and you get a response that Siri can’t do that for you. This may be understandable for security-related settings, but it would be nice to be able to say “Turn on the VPN” and have your phone prompt you for your VPN password, instead of having to open the Settings app. Search has improved big time in iOS 7—or maybe we should say “Bing time.” Yes, Microsoft’s Bing is now the browser engine of choice for Siri; pose a query, and the results display embedded into the Siri overlay with options to visit the site, perform an alternate query, or search Twitter for the same sentence. Never fear, Google devotees: You can still use the search giant’s feature by saying “Search Google for” before your query. Siri now uses Bing for its inline search; if you still want to use Google, though, you can preface your search with a Google-friendly query. Wikipedia, too, is now a part of your device’s virtual assistant. Search by starting your query with “Tell me about” or “Search Wikipedia for”; the initial result shows the image (if applicable) and first paragraph of the subject’s Wikipedia entry, with options to search for an alternate query. To read the full page, you still have to tap the entry and enter Safari. 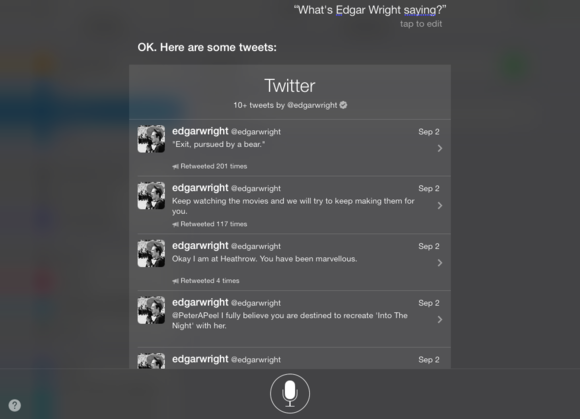 See what your friends are up to on Twitter via Siri. Siri shows the top 10 tweets applicable to the search, along with the user’s name and profile picture, but you won’t be able to see more unless you visit the Twitter app directly. How do you say “call”? iOS 7 brings a few other niceties to Siri, including learning your friends’ names, displaying your missed calls, and reading back your recent emails. 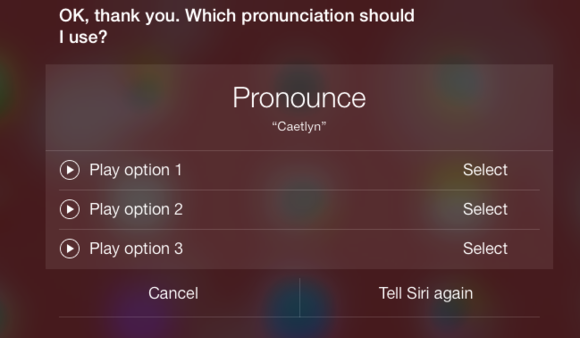 If you have a person in your contacts with a particularly tricky name, you can teach Siri how to pronounce it. Just say “That’s not how you pronounce name of person’s name” to begin the process. Have a friend with a tricky name? Siri can learn how to pronounce it. Siri also displays your missed calls (“Do I have any missed calls?”), new voicemail messages (“Do I have any voicemail messages?”), and new email messages (“Do I have any new email?”). Unlike in previous versions of iOS, Siri can now read those emails back to you. Say “Read me my email,” and Siri speaks the time stamp, from line, and subject line of your last ten messages, or say “Do I have email from person” to have Siri list messages you’ve received from them. Unfortunately, Siri only displays the messages present in your inbox—it can’t search through any other mailboxes currently. 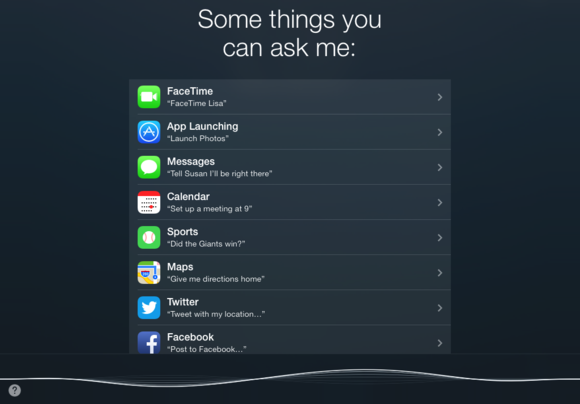 Siri can now read you the contents of your email, but only those in the inbox. You can also say “Read my latest email,” “Read my email sent at time,” or “Read the number in the list one” to listen to the full body text of a particular message.